City Owl Press, 9781944728816, 212pp. Pursued by Ireland's notorious pirate queen, Maeve O'Malley is on a quest to Ireland's medieval past to save the future of her clan and break her ancient family curse. Learning to use her haunting visions to travel to medieval Ireland leads Maeve on the adventure of a lifetime, or centuries of lifetimes. 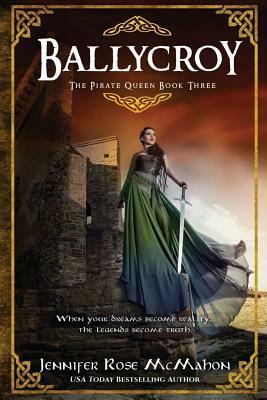 Outlander meets Red Queen in this epic Irish adventure of seers and curses by USA Today Bestselling author, Jennifer Rose McMahon If you like Diana Gabaldon, Emily R King, and Susanna Kearsley, you will love this fast-paced, unexpected conclusion to the Pirate Queen Series. A: Happy, dreamer, free spirit, summer addict, wanderer, coffee lover. When I'm not at the beach, surfing, writing or in tree pose, I'm in disguise as a high school guidance counselor helping teens navigate the high speed roller coaster of adolescence in the 21st century. I can also be found in the yoga studio teaching poses and breath work to the students at my school as well as the faculty. A: I like to write magical realism and historical fiction. I've always been drawn to the idea of ghosts or being guided by ancestors and have had an unusual fascination with old cemeteries for as long as I can remember. My books are based on these genres.